One of the great things about tennis is that it’s not only a ton of fun, but it’s a great way to stay in shape. This is important because a lot of people have a hard time staying in shape because they aren’t motivated to get to the gym. However, once these people fall in love with tennis they’ll be able to reap all the health benefits. Although tennis can cause some elbow and knee pain, for the most part injuries are few and far between. It is generally a low-impact sport and doesn’t require a person to exert themselves to the point of an injury. Because of this, people can play tennis throughout their lifetime. This is one of the reasons the sport is so popular. Tennis is enjoyed by people of all ages because it is conducive to anyone’s level of physical fitness. Yes, being a great tennis player does require speed and agility but if you play people at your level of physical fitness then it’s an even playing field. Heart disease is the single leading cause of death in the United States, yet it is so preventable. Fortunately, tennis is a great activity for improving cardiovascular health. One great aspect of tennis is that it is a form of both anaerobic and aerobic exercise. That is, it requires you to run short sprints during sets (anaerobic), but also takes place over long durations and requires an exertion of effort for 1-2 hours (aerobic). This combination lowers your risk of heart disease and stroke down the road. 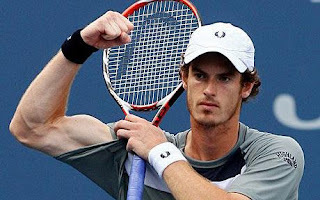 During a tennis match you’re going to use many of the muscles in your body: Your thighs and calves when sprinting, as well as your back, arms and shoulders when swinging. These aren’t just static movements either, which keeps your joints healthy. Playing tennis won’t make you a bodybuilder, but it will help keep muscles toned and in great shape. Tennis is a sport that requires you to constantly be moving your whole body. You must be able to quickly spot the ball, chase it down, and reach out to get it (flexibility). You then have to be able to stay upright (Balance) so that you can get back in position to receive the next shot. Playing tennis regularly helps to keep all these movement in sync, which can carry over to other areas of life. Running across the court, lunging, twisting, jumping and turning—tennis can be quite the workout. It requires you to use every part of your body which means you’re going to be exerting more effort overall. Tennis is a great way to burn calories and burns more calories than many traditional forms of exercise like walking, cycling and weight lifting. In fact, according to HealthStatus, a 150-lb. person can burn approximately 414 calories in an hour of singles tennis. While a 190-lb. person can burn 524 calories in an hour of singles tennis. In fact, we calculated that from the 140,440+ Tennis League Matches played, the average player has burned 1,200 calories! 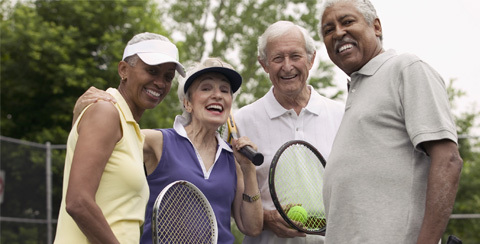 If you’re looking for a great way to stay in shape, play a competitive sport, and have a ton of fun, sign up to Tennis League in your city today.